Perfect for families with small children. 5 days was not enough. Exactly what as expected. Wonderful Disney hosting in a well designed and maintained facility. Disney is pricey but always worth it. I had a person with special needs and the hotel quickly got us into the correct room to support her. The chefs at ALL of the restaurants also went out of their way with her dietary needs! Beautiful place. Kids friendly. A lot to do for adults as well. The public shower area needs improvements. The area is very small for the hotel. 3 showers stalls for each man & woman. We had to wait for a long time to get showered right before we left the hotel. Some of the excursions offered at the hotel are more preteen/teen friendly than kids friendly. I mean how could you call it kids friendly when there is no restroom? The worst hotel experience. Slow and irresponsible staff. Check in and room service were highly inefficient. All you will hear is “please hold or leave a message.” Avoid this hotel. Nice hotel but very expensive, particularly since no meals are included in the price. Also, rooms near the main lobby are not as quiet and i had hoped - music from the area below is easily heard. Missed the hand wipes at the buffet line that was customary on our Disney cruise last year. Glad we had a rental car as the resort offerings that we were interested in were limited to swimming. The Staff were very good and pleasing but not at all directed well. What I mean is that Disney is famous for taking care of the "little things that count" much more so than others. This did not happen at this facility The staff seemed well trained in being "Happy" which I understand is the ultimate product. I attended Disney Training at the Florida Institute with my Executive Staff. The Execs and Managers at this Hotel need that training. There were plenty of people and staff---They just didn't seem to know what to do and where to do it at times. Great vacation but parking is expensive 37$ per day. Hotel was great but for the amount we paid, the food was terrible and highly overpriced. We ended up walking to the neighborhood restaurant as the food at the hotel was terrible. I expected much more for a hotel of that caliber. Right when my son and I arrived all the staff were friendly and took good care of us. Staff recognized us just from one time and made us feel special. I feel the rooms were fairly small and we had a very nice room with king and couch pull out but our one bedroom room in koOlina Marriot was much larger x3 and 150 less. Nevertheless everyone was very nice and the pool area was fun i was a bit shocked and disappointed the Rainbow Reef was an extra charge. We enjoyed the evening character buffe. My aunt warned us parking is too $$$ so we parked at Marriott since we double booked the rooms . We loved the characters. That was a great experience Thank you. 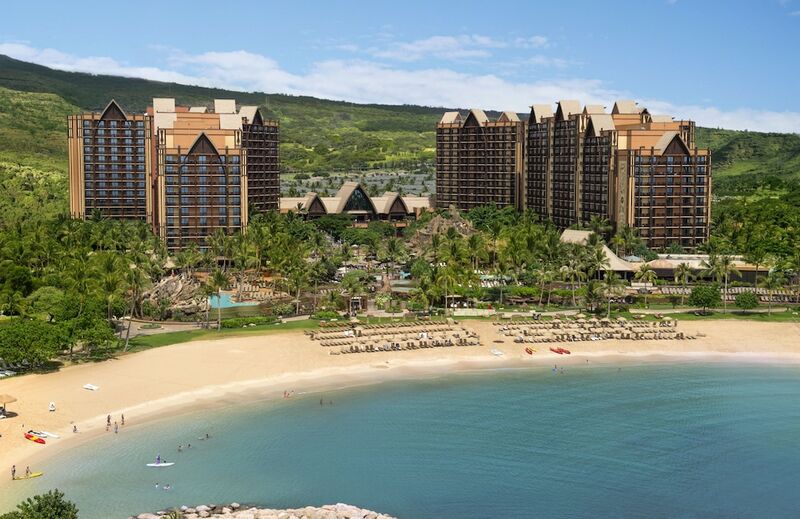 Aulani, A Disney Resort & Spa places you within a mile (2 km) of popular attractions like Ko Olina Marina and Ko Olina Golf Club. This 359-room, 4.5-star resort has 3 outdoor pools along with a full-service spa and a free water park. Enjoy dining at the resort's 2 onsite restaurants: AMA AMA specializes in Hawaiian cuisine and serves breakfast, lunch, and dinner; Makahiki offers relaxing pool views. Savor a meal from the privacy of your room with room service, or get a pick-me-up at the coffee shop/café. For your convenience, a buffet breakfast is served for a fee each morning from 7 AM to 11 AM. Guests can expect to find a flat-screen TV with satellite channels and a DVD player. Along with relaxing touches like a rainfall showerhead and a soaking tub, the bathroom offers hair dryers and free toiletries. Other standard amenities include a furnished balcony or patio, an iPod dock, and a refrigerator. Aulani, A Disney Resort & Spa features a full-service spa, 3 outdoor pools, and a free water park. Parking is available for USD 37 per night (USD 37 per night for valet parking), and there's also an area shuttle for a fee. Multilingual staff at the 24-hour front desk can assist with securing valuables, tours or tickets, and luggage storage. Other amenities at this beach resort include a lazy river, a children's pool, and a 24-hour fitness center. AMA AMA - Beachfront restaurant and bar specializing in Hawaiian cuisine. Open daily for breakfast, lunch, and dinner. Alfresco dining available (weather permitting). Reservations required. Makahiki - Buffet restaurant specializing in Hawaiian cuisine. Open daily for breakfast and dinner. Pool and garden views. The Olelo Room - Bar specializing in Hawaiian cuisine. pool and garden views. Open daily. Off the Hook - Poolside bar open select days. Alfresco dining available (weather permitting). Ulu Cafe - Poolside café serving breakfast, lunch, and dinner. Alfresco dining available (weather permitting). Kid's menu available. The resort has 3 outdoor swimming pools and 4 spa tubs. A children's pool, a complimentary water park, a lazy river, and a 24-hour fitness center are other recreation options. Guests under 18 years old are not allowed in the swimming pool. Guests can start the day with a buffet breakfast, live entertainment, and visits with Disney Characters at Makahiki restaurant; surcharge applies. Full details at check-in. Reservations recommended. Price is USD 39 for adults and USD 20 for children ages 3-9 years old. Fees subject to change without notice. Taxes and gratuity may not be included. Offer subject to availability. Offer is not valid with groups/conventions and may not be combined with other promotional offers. Other restrictions and blackout dates may apply. "nice Home", Away From" Home"